King Mohammed VI on Tuesday fired three ministers, a secretary of state and several senior officials, after an audit showed their responsibility in the malfunctions and delays recorded in the implementation of a large-scale development program, the Al Hoceima Lighthouse of the Mediterranean. The $665-million worth program, designed to promote the development of the Northern city of Al Hoceima and its region, was launched in October 2015, under the previous government of Abdelilah Benkirane, leader of the Justice and Development Party (PJD). The findings of the audit, commissioned by the king to determine the reasons for the delay in the Al Hoceima program and carried out by the Court of Auditors, known for its objectivity and transparency of its investigations, were presented to the Monarch Tuesday. The Court underlined in the report that the investigation confirmed the existence of several malfunctions under the previous government. The report also revealed that several ministerial departments and public institutions did not fulfill their duties as regards the implementation of the projects and that the explanations they provided do not justify the delay in implementing the Al Hoceima development program. “Even worse the vast majority of these projects had not even been launched,” the report noted. Yet, the report made it clear that there were no malpractices or misappropriations. The lengthy audit process of the Court of Accounts, chaired by former Prime Minister Driss Jettou, helped provide the necessary transparency and distance that dissociate the report results from the protests staged in late 2016 and early 2017 in the city of Al Hoceima. Three members of the current cabinet, who also held portfolios in Benkirane’s government, were thus dismissed. These are Mohamed Hassad, Minister of Education, who was at the time of the launch of the Al Hoceima program Minister of the Interior, as well as the Ministers of Health Houcine El Ouardi and of Housing Nabil Benabdellah. Larbi Bencheikh, Secretary of State for Vocational Training, who was director of OFPPT, a public vocational training body, and Ali Fassi Fihri, head of the National Office of Electricity and Water (ONEE) have also been relieved of their duties. The firing decision made by King Mohammed VI after consultation with the Head of the Government, is part of the application of the principle of accountability stipulated in the 2011 Moroccan. King Mohammed VI instructed the Head of the government Saad Eddine El Othmani to submit new names for the vacant positions. It was also decided that the 20 or so other former ministers and officials mentioned in the report for their liability in the malfunctions will never again be named to official positions. These include the former ministers of National Education, tourism, Youth and Sports, and culture and the junior minister in charge of environment. The audit report, on the other hand, noted a greater mobilization of the various stakeholders, as well as a notable progress in the projects implementation, following the Council of Ministers, held on June 25, 2017. During this Council, King Mohammed VI had voiced his disappointment, discontent and concern over the slow pace of development projects and given directives to relevant departments to speed up the implementation of the projects in the Rif region. It was during this council that the Monarch ordered the audit. The King, while praising the efforts made by the current government to speed up the implementation of the programmed projects, instructed the cabinet to draw lessons from the difficulties encountered in implementing the Al Hoceima Lighthouse of the Mediterranean program in order to avoid the dysfunctions and obstacles that could hinder the implementation of development projects in the different regions of the Kingdom. 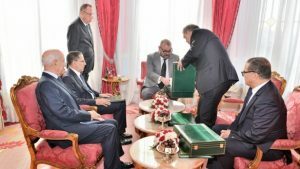 The Tuesday unprecedented move comes after King Mohammed VI has repeatedly underlined in several royal speeches the need to enhance the performance of the administration and improve the services provided to citizens, deeming managing citizens’ affairs and serving their interests are both a national responsibility and a sacred trust, leaving no room for negligence or procrastination. “Holding public office is linked with accountability, and during which appropriate answers and solutions to citizens’ pressing problems and issues must be found,” the King had said in a speech earlier this October when opening the Parliament fall session. “As the guarantor and custodian of the rule of law, and the first person to respect it, I have never hesitated to hold to account anyone who has patently underperformed while carrying out his or her professional or national duties. However, the situation today commands greater firmness in order to put an end to complacency and to disregard for citizens’ interests,” the Monarch had stated, urging the Court of Auditors to monitor and assess the implementation of public projects in all of the Kingdom’s regions. Written by: Jaber Ali on October 25, 2017. Posted by Jaber Ali on Oct 25 2017. Filed under Headlines, World News. You can follow any responses to this entry through the RSS 2.0. Both comments and pings are currently closed.